Christmas is the Christian holiday that celebrates the birth of Jesus Christ. Most Western Christian denominations traditionally celebrate this event on December 25th, although Christmas events also are held in the preceding weeks, in the period known as advent. A game of bingo is a fun way to celebrate the holiday. 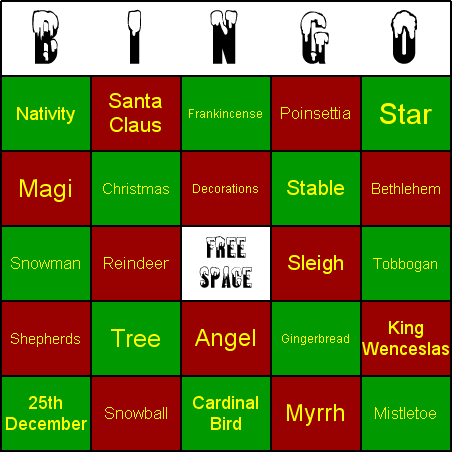 The game is played just like the familiar version of bingo, except that rather than using standard bingo cards, the game is played using special cards that are printed with words and phrases related to Christmas. If you want to organise a game of Christmas themed bingo, the main thing that you will need is obtaining some bingo cards containing the words and phrases that relate to the Christmas . You may be able to purchase pre-printed cards but that could be expensive and you might find that such cards do not contain the precise items you want anyway. My suggestion is to print the bingo cards yourself, using your PC. This process may be easier than you might think: You can download a bingo card maker program, and you can print out bingo materials with just a few minutes work. Lastly, one final thing that should be mentioned is that Christmas bingo is also suitable for ESL/EFL (English as a Second Language/English as a Foreign Language) and foreign language (for example Spanish, French or German) classes. This is since it is not only a lot of fun, but also can be highly educational.